The Korean society has been slowly opening up and speaking out about their social and political values through various methods such as hashtags, slogan fashion, and changes in their consumption methods. To speak out on social and/or political values that one believes in through these methods is defined as ‘meaning out’. This is a new trend emerging in the Korean society where more people are beginning to speak up about their political and/or social beliefs without worrying about what others may think of them. “Meaning out is seen to be a courageous act in today’s society, as there are many people that speak out against what they deem to be immoral or unjust, while also creating some changes in the end,” said Kim Hern-sik, a culture critic. “That’s why so many consider it to be of great value.” Even though the Korean society has become more open to expressing individualistic ideas and accepting that people can have different ideas, it is still common to find many people hating those who may have different mindsets than the majority of the society. Through ‘meaning out’, many have started to favor the meaning that comes from their actions and their words more than anything else, and therefore contributing to the increase in number of those who wish to speak out about what they believe in. While this may seem like a big step towards social change, the backlash against controversial valued hinders individuals from meaning out with confidence. common belief. “If you look at the social and/or political background from ten years ago, speaking out about values going against the government was mostly forbidden, which naturally led to other ideas going against the common belief controversial as well.” Because of this, people naturally became quiet about other values that contradicted common thinking. Then, there was a spark in the Korean society after the candlelight vigil against the Park Geunhye administration; Koreans began to realize that change could and should be made through the people if those in charge were not taking action. After the candlelight vigil, Koreans started to actively speak out about other issues that matter, in order to create more positive and progressive change. Ever since then, Kim Yeon-seo, a Sophomore from the Division of International Studies, explained that people have started to notice the things that are wrong in the Korean society that they want to change. Therefore, people have moved on from the movement that spoke out on their political ideas to supporting other social issues, such as LGBT rights and feminism. “When one begins to realize the changes they want to create in a society and start to take respective actions, I believe otherswhom have silently supported the same movement will begin to notice and also act to create change together, like a chain reaction,” added Yeon-seo. Meaning out in today’s society is being done in several ways, but three different methods are the most significant. First, social media platforms, such as Twitter , are the most convenient sites to freely express one’s thoughts, which also allow active discussions. For that reason, hashtags have become a method of meaning out, where people can deliver their beliefs in a prompt and concise manner. Examples of such hashtags include #Prayfor0416, which was a hashtag used to honor the victims of the Sewol Ferry incident in 2014, and to show criticism towards the Park Geun-hye administration for dealing with the issue in such a poor manner. Yeon-seo said that she also used hashtags like #PrayFor0416 to honor the victims, and that she has also recently used the hashtag #WithYou to give support to those who have voiced their experiences with sexual harassment through the #MeToo movement. Second, Koreans are meaning out through slogan fashion. Slogan fashion includes shirts that say ‘This is what a feminist looks like’, or even phone cases that say ‘Girls can do anything’. Recently, many Korean celebrities are being shown with fashion choices that include such slogans. Fashion columnist, Park Se-jin, stated that “When celebrities are seen wearing clothes that show support towards a certain social or political issue, there may be backlash at first from those who are against it, but it will also act as an important factor in letting people get used to the ideology. The more people are exposed to the idea, the lower the hurdles in accepting proposals for social and/or political change will become.” Park also added that slogan fashion is the easiest way to promote certain ideas, since it so openly exposes others to see another person wearing the slogan. Lastly, there have been changes in people’s consumption patterns. One can be vocal about an issue that they support, but real change occurs when it is truly reflected in a person’s actions and lifestyle, through methods such as consumerism. One can show their support towards animal rights by only buying vegan cosmetics such as thoseproducts from LUSH, or foods with signs that indicate the food was processed without animal abuse. Such products are usually more expensive, but the number of people who have begun searching for such products has increased significantly. In addition to these three methods, culture critic, Kim Hern-sik, outlines that theatres have begun to express their support toward certain issues through their productions, and one can even choose to support a certain movement through their choice in music or movies. 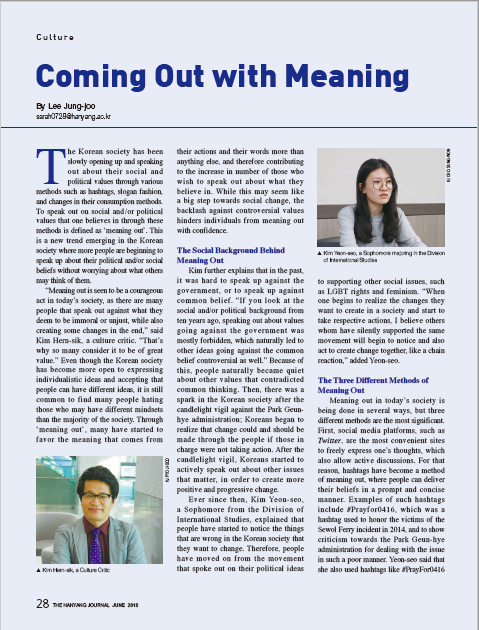 The common opinion that points to the reason why meaning out has become so popular in today’s society is due to the overwhelming need of being recognized by everyone else amongst the Korean society. Some may truly engage in meaning out for the sole purpose of raising awareness, but there are also those who act in order to satisfy their desire for recognition. In the past, people who expressed their beliefs were often publicly seen as peculiar, but now it is becoming more acceptable. There are several pros associated with this new trend. According to Kim Yeon-seo, meaning out allows people to realize that it is not scary to publicly portray their beliefs to the society in comparison to the past. However, there are also disadvantages, which are evident in anonymous comments bashing celebrities that promote controversial emerging ideas such as feminism. Irene, a singer in the K-pop group Red Velvet, was criticized recently for promoting a feminist book, ‘Kim Ji Young Born 1982 ’, during a meet-and-greet with her fans. People who genuinely want to express their social or political values may see incidents like this, which not only hinders them from meaning out, but also makes people who support certain values vulnerable to those who do not. There are disadvantages associated with meaning out, and such disadvantages cannot be ignored. However, it is important that meaning out, in whatever method it is done, can serve in creating real change for the future.